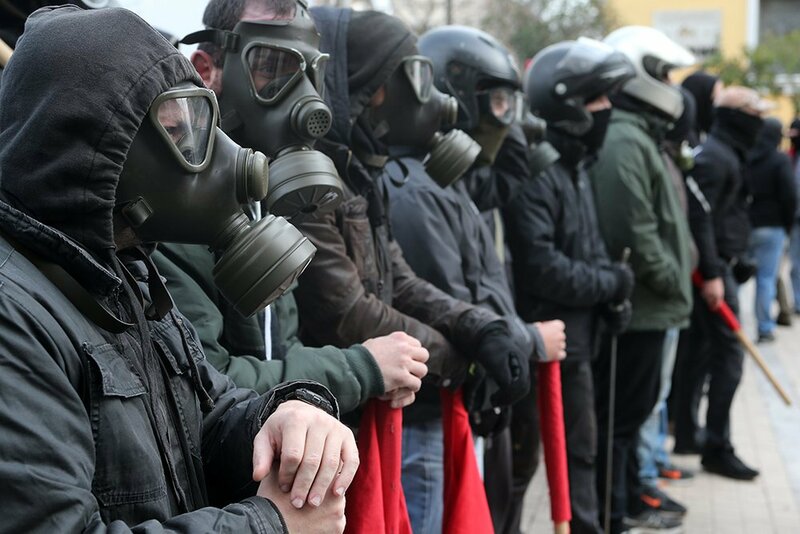 After the fascist attacks on self-organized squats during a nationalist rally in Thessaloniki last month, comrades in Athens were on high alert over the weekend during a similar nationalist demonstration. The dispute about the name of FYROM between Greek and Macedonian nationalists is leading to an aggressive nationalist agenda in both states. Fascists attacked the self-organized space Empros yesterday, but antifa activists were able to repel the fascist attack. Cops attacked an office of Antarsya but this attack was also repelled. Published by Enough is Enough. Written by Riot Turtle. Read all the reports of Riot Turtle; here. Everybody in Greece knows that these fascists attacked 2 social centers in Thessaloniki last month, the Libertatia squat was burned down during these attacks. Still the participants in yesterdays nationalist demo in Athens didn’t see a problem in marching together with the fascists. The well known composer Mikis Theodorakis started his speech on the nationalist demo with: “My beloved Greeks, fascists, nazis, anarchists and others”. That was an answer to who critized his appearance on the nationalist demo as reactionary, especially the leftwing critics. The position of Theodorakis remained the same: In a diplomatic solution to end the dispute between Greece and FYROM about the name of the FYROM state the name Macedonia should not be included. Theodorakis attacked the current government and the minorities that support them: “We are not nationalists, but we are all patriots” is the sentence that was quoted the most in social media. But that wasn’t enough. He also said: “The worst fascism always was lefwing fascism”. Mikis Theodorakis, composer and symbol of resistance to Greece’s military junta in 60’s and 70’s now sharing a platform with the ideological and spiritual descendants of that very, same Junta. The current nationalist mobilizations are an ordinary power struggle between Greek elites. An attempt to remove the Syriza government and its not surprising that the main motors of the nationalist mobilzations are the conservative party Nea Demokratia, the church and the fascist Golden Dawn party. Our anti-authoritarian comrades don’t have a problem when the current Syriza government would be removed, but of course won’t support a campaign which goal is to replace the current government by a conservative government with a strong nationalist agenda. But yesterdays nationalist demonstration wasn’t a success, although conservative TV stations like Skai mobilized for the demo the expected one million people didn’t came. That didn’t bother the organizers of the demo. Many people fantasized about the numbers of the nationalist demonstration. One million, 1.5 million…. In reality more than 100.000 people took the streets and marched together with Golden Dawn and other fascist parties and groups in Athens yesterday. The cops stated that 140.000 people attended and released a video (below) to to back up their claim. On Saturday there was an antifascist demonstration and people started antifascist patrols in several neigbourhoods in Athens. The fascist Golden Dawn party could not gather on the square where they wanted to held their fascist rally because of antifascist counter protests. A couple of hundred fascists had to gather in front of the Golden Dawn party office in central Athens. In the night hours cops attacked an antifa patrol on Monastirkai square on Saturday night (video below). On Sunday antifascists took the streets of Athens and organized the defense of the Exarchia neighbourhood and several squats and other leftwing projects across Athens. Fascists tried to get into the Exarchia neighbourhood but their interventions were repelled by antifa activists. An attack against the self-organized free space Empros was also repelled. Cops attacked people who were guarding an office of Antarsya, but this attack was also repelled by antifa activsts and the cops had to retreat (video below). It was a bad and a good day. It was bad that again more than 100.000 people took the streets for a nationalist agenda. It was good that our comrades managed to repel attacks by facists and cops. In Heraklion (Crete) antifascists also took the streets. The nationalist mobilization was a disaster on Crete. Antifascists patroled self-organized squats in Heraklion and spread information about the FYROM issue which was positively received from passers-by (images below). #Athens: Statement by #Empros After Fascist Attack – Enough is Enough!